Having that small screen on a smartphone or a tablet makes it a bit hard to play some games. A dedicated gaming control would have been perfect, and if you don’t feel like spending huge sums on that, the Nyko PlayPad has arrived fitting all those requirements. At $39.99, this Bluetooth wireless controller is among the more affordable options. It hat supports iCade, and you could use it while hooking up your tablet to an HD TV for a more immersive experience. 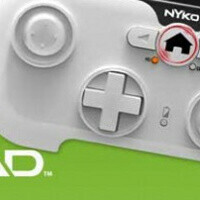 The Nyko PlayPad comes in a regular and Pro version, with the latter optimized for some of the latest Tegra 3 Android titles. Both controllers require Android 3.0 or newer, and arrive with the Playground app for backwards compatibility with games. The controllers have the usual set of buttons you’d expect - d-pad, dual joystick sliders, four action buttons, and shoulder buttons. Hit the source link below to learn how you can get them. Android friends please check this one out its really nice! http://www.youtube.com/watch?feature=player_embedded&v=68XH6SCXqcc#! I like that controller, thanks for the link. Do you own it? Wondering how well it works with emulators. Emulators that support it work amazing!!! love super mario 3 all over again. works with my optimus tablet as well! I have a MOGA, its pretty cool just needs access to more games. This looks like the layout might be better but mine holds the phone for you! Be nice if i can get it to work with my Nexus Q!